Designed, tailored and optimized for everyday creations with the power of 3D Printing, all in a single doodle pen. 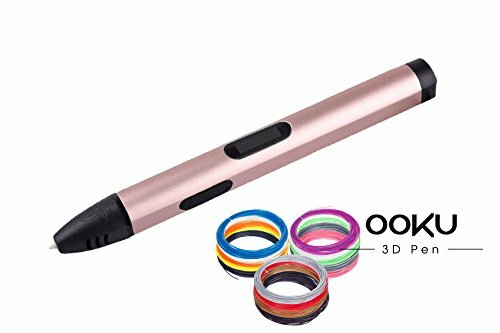 From simplicity of use with auto-feeding of any 1.75 mm PLA/ABS material, to the natural fit into your hands, to low temperature ceramic head, the OOKU 3D Doodle Pen brings your creative imaginations to life with OOKU’s micro 3D printing pen technology. Quickly melt and cool the ABS/PLA/HIPS printing material to create rigid free standing structures, forms, and shapes. Create individual parts and pieces or combine pieces together to unleash your imagination. On demand Prototyping, drawing, and crafting is here. – Ooku’s Natural Slim Fit design ensures the pen fits to your hand comfortably & naturally at just 52 grams. – Simplicity of use -plug in, select filament type, heat up, and create. – 3 Extrusion speeds with automatic flow, without the hassle of controlling temperatures. – Slender 0.7mm tip takes precision and detailing to a new level. – Lower temperatures and greatest heat efficiency keeping the pen cool and safe during use with ceramic head. 1. This 3D Pen is suitable for children and adults over 8 years of age. Supervision of small children during product use is required. 2. The output nozzle tip can reach 250 degrees F so keep your hands and fingers away from the nozzle and avoid direct contact. A HAND HELD 3D PRINTER PEN: Prototype, craft, and create pieces and objects by drawing with the pen using 3D printing plastics like 1.75mm ABS or PLA Filament – Think like a builder by combining parts and pieces of objects to form a new grander object. CREATE EASILY with our simple of use Ooku 3D pen design. Just plug in, power on, select material type, heat up, and create. 3 adjustable automatic extrusion speeds without worrying about material flow, and without the hassle of setting different temperatures. At 52 Grams, Ooku’s LIGHT NAUTRAL FIT design ensures the 3D Printing Pen fits into your hands comfortably and naturally – like holding a marker. No heavy or bulky shaped designs that cramp up your style and hands. NO maintenance or jams with our SMART Infeed and Extrusion design. USB POWER Cable Included – providing you with more flexibility to use and create outside or on the go, when connected to any power source like your Laptop, Battery Power Bank (2A output or greater). AC Wall adapter not included. 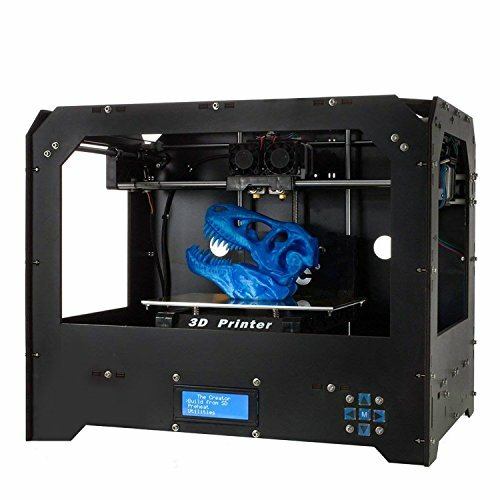 Now that 3D printing is becoming more and more popular, why don’t more businesses look into using 3D printers for prototyping? Y Soft says the transformative abilities of 3D printing have been seen across many industries. New research from IDC also shows the global 3D printing market is on track to continue its expansion, as it is forecast to exceed US$35 billion by 2020, doubling the US$15.9 billion forecasted for 2016. Adam O’Neill, managing director of Y Soft Australia, affirms that 3D printed rapid prototyping is becoming very popular for product design. “The ability to turn a vision of a product into reality in a matter of hours has accelerated the manufacturing cycle, and reduced the time it takes to perfect a design before production,” he says. “We are also seeing increased use of 3D printing for prototypes and hypothesis testing in the educational and medical sectors,” explains O’Neill. Faster, more cost-efficient research and development (R&D) as it lets designers assess structure and dimensions early on and give appropriate approval before mass production. Reduced product material costs as there is less rework and waste material. Closer relationships with customers to achieve individuality in products. “Using 3D technology for rapid prototyping helps R&D teams achieve geometries in their designs that are not possible with traditional mould and cast techniques,” says O’Neill. Y Soft also mentions that being able to customise prototypes and products for customers will help New Zealand and Australian businesses compete more effectively against competitors.